For a book that consumed my attention nonstop for an entire day, I sure was left feeling unsatisfied. The premise sounds delicious. A beautiful home, stark and pristine and worth far more than the rental price. Okay, so fine, there are rules — about 200 different items that tenants must agree to in order to live there. And then there’s the fact that only a select few are considered worthy: A lengthy, intrusively intimate questionnaire only possibly gets you in the door for an interview with the property’s architect and owner, and even then, you’re likely to get turned down.. But still, in a tight housing market where even exceeding your budget gets you little better than a dump, this place is a true find. The Girl Before is told in alternating chapters, of “Then: Emma” and “Now: Jane”. As their stories unwind, there’s no doubt that these two women, both vulnerable and bearing emotional scars, are just the sort of easily manipulated prey that might appeal to someone who needs total control. As we get to know each woman, we learn why the house at One Folgate Street appeals to them, and why they’re so eager to upend their lives that they’re willing to accept the terms and conditions that come with the home. Warning signs abound. There are the odd little facts about the history of the house’s origins, the architect, Edward, and his personal life. There’s Edward himself, who’s quite overly involved for a rental landlord. Emma moves in after a terrifying crime, and Jane after a personal loss, but both are desperate for a fresh start — desperate enough to overlook the little clues (oh, like a house that’s programmed to only turn on the shower after you do a regular assessment of your moods) that they may be in over their heads. 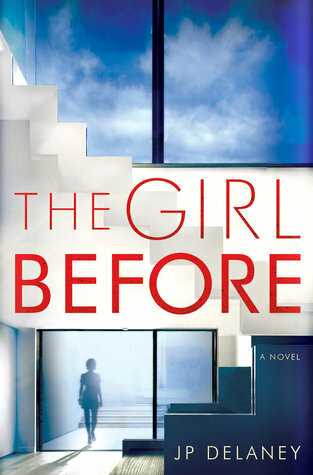 The Girl Before is a thriller that pushes all of a reader’s buttons, with plenty of clues and alarms and suspicious behavior. I could not put it down… but that doesn’t mean that, in the aftermath, I actually enjoyed reading it. In fact, certain characters are so not at all what they seem that the revelations and the book’s climax seem to come completely out of the blue. And yes, that’s what thrillers try to do — throw the reader off the scent, come up with a scenario that hasn’t been done before, one we never see coming. But it has to make sense, and I’m not sure that the climax and denouement of the story actually do. I also, I will admit, am predisposed to dislike “girl in peril” stories, and setting up these two characters as victims and people easily controlled, for different reasons, kind of set my teeth on edge. By the end, although Emma’s circumstances should make her an object of pity and sorrow, it’s hard to feel any compassion for her, the more we get to know her. And Jane is all over the place too, although at least she ultimately displays some backbone and agency. In the end, while I couldn’t stop reading, I wound up feeling rather cheated. Plot points that were practically lit up in neon ended up being red herrings. Characters’ actions in the big reveal seemed totally divorced from what we’d known of them up to that point. And again, I found it pretty much impossible to care at all about Emma once a particularly unforgivable action of hers is revealed. So, do I recommend The Girl Before? Not so much. It’s a thriller, to be sure, and it was a good diversion on a rainy day (which is why I spent all day indoors today reading it, instead of going out where it’s wet and chilly). But I don’t like the portrayal of the women characters’ actions or motivations, and didn’t feel like their inner lives made a whole lot of sense or did credit to them as people. Are we supposed to be impressed by his ability to get inside the women characters’ heads? For me, at least, it didn’t work. Maybe that partially explains my feelings about the characters. Not that a male author can never write from a female perspective, but it takes a great deal of talent and empathy to do so convincingly. The Girl Before misses the mark. I’ll end this rambling review with a not-too-surprising insight: Writing reviews is pretty cathartic. As I sat down to right, I was still feeling overall kind of positive about The Girl Before. But now that I’ve been actually putting my thoughts together, I’m left with a pretty deafening UGH. The last third or so of this book made me feel used and manipulated, and that’s not a good thing. Can I get my rainy day back for a do-over? I’m with you on many of these gripes – though I haven’t read the book! The longer I think about it, the more angry/annoyed I get! I’d say skip it. Exactly! And then I was disappointed with the turn the story took. I really wanted to know more about the rules and the house’s control systems, etc, but that never really went anywhere. Ugh. The premise honestly sounds really really interesting, but I hate it when in the end, the story doesn’t deliver. 😦 I wish it could have ended better for you, Lisa! I know, I thought the premise sounded great! I wish the execution had carried it through in a better way. Such an unsettling book. Great review. I agree with you…sometimes I come away from a book thinking I’ve liked it, and as I start to write my review I realize I didn’t like it all that much!